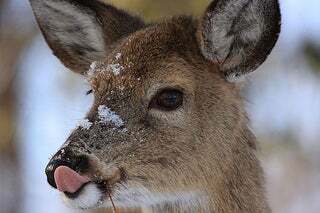 During the harsh winters of the 1990s, the Minnesota legislature established an emergency deer feeding program funded by a hunting license surcharge. It was last used in '97, then because the money went unspent during milder weather, the program was expanded to include the study and eradication of diseases. Ten million dollars have been spent since 2004 to combat and monitor chronic wasting disease and bovine tuberculosis from the funds raised by the deer-feeding tax. Because this is another harsh winter with deep snow especially in the northern part of the state, the Minnesota Deer Hunters Association have been aggressively lobbying the state Department of Natural Resources to feed the starving animals, but officials had refused citing the program's steep cost, questionable effectiveness and that by encouraging animals to congregate, it could attract predators and help spread disease. After several weeks of negotiations, MNDNR has agreed to provide feed for deer within a defined area and have budgeted $170,000. It could take two weeks for the pellets to be delivered and when they arrive, the food will be distributed by volunteers from the hunter's association. The neighboring Wisconsin Department of Natural Resources said Tuesday that they would not be able to launch a similar program without legislative approval and they cautioned residents against feeding straight corn because it can't be properly digested by the animals in winter. Wisconsin officials have reportedly found several dead deer with full stomachs.